Just having a quick look at this to try and identify circuits from the colour of the fuses (cartridge or wire, not sure which). I know these are getting less common as time goes on, but it would be helpful dealing with old installations. I think that red dot is 30/32 amp for ring mains, white dot is 5/6 amp lighting. However there seem to be two blue dots. As far as I know there is 13 amp, lighting, an electric oven from Ikea (which may or may not be 13A), a combi boiler (which may or may not have its own circuit) and an electric shower which should have a green 45A. There are two red dot, one white dot, and two (apparently) blue dot. You absolutley mustn't assume things are wired up logically or correctly or to the fuseways you think they should be. If it's really old and converted radial circuits, you could find a ring circuit with a 15A fuse on each end of the ring. There is no longer an immersion heater. The fuse cover has a note of which fused serviced it but is definitely out of date. There is an electric shower which needs a dedicated 45A circuit and I can't immediately identify the expected green fuse carrier. I am persuading the home owner to power down and pull the fuses to look at the backs. I suspect that a blue fuse carrier (previously for the immersion heater) may now have a higher power fuse in for the shower but I would like to check to be sure. 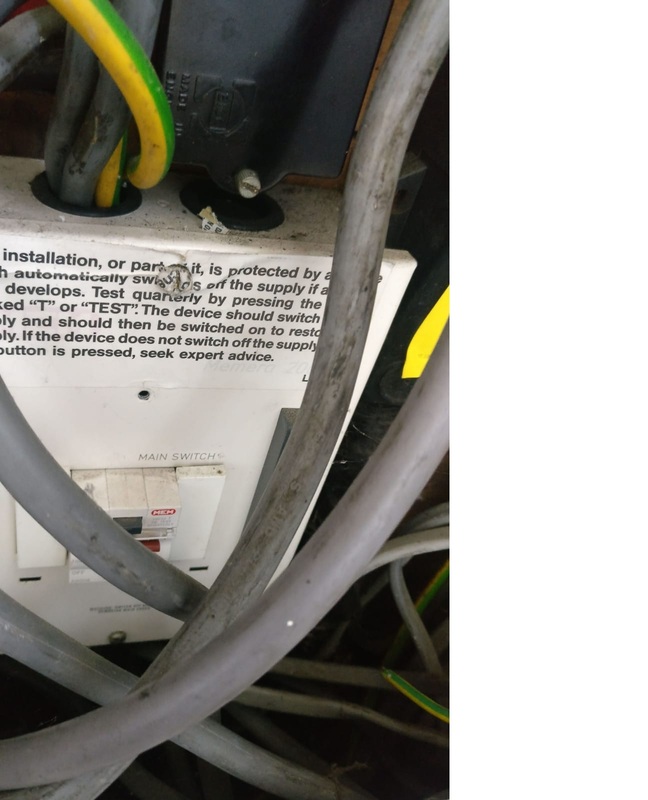 The house was previously a rental and had an electrical safety check a few years back. I am assuming that simple things like fuse ratings were included. I suspect that this is the rewireable fuse wire holders. They had two dots on them. And it passed the inspection? As posted a while back I was distracted by the waste pipe buggeration and the hardest bricks in the country, otherwise I would have had the time to investigate. The blue dots, if they do have 15A wire in them, could be running anything. More likely candidates would be... well, anything. The obvious solution is to pull them with power off to see what they power. Do not do this while o n, those carriers have live parts so close to the wings that they're likely to be touched while removing the fuseholder. Typically 15A - so radials to dedicated appliances, or perhaps small bunches of sockets. I don't recall ever seeing that style of CU with green dot fuses. Only what you have, and possibly yellow. Yup, bog standard 6 way wylex BS3036 rewireable fuse box. The fuse carriers look like Blank, 15A, 5A, 15A, 30A, 30A going left to right. Small CU with another RCD (might be downstream of the Mem branded one in the other box). You have two circuits, a 40A and a 32A. The former is probably the shower circuit. I would guess this CU was added when the shower was installed. I did post some wide angler shots before the house purchase but it is a rat's nest and I couldn't trace the wires in the brief time I spent looking. I'm now wondering what the spurs might be for. It would be nice of one was for the fan oven and the other for the combi boiler. I should give up guessing and wait for the owner to get round to the diagnostic work. You've got a 40A breaker in the new CU - that's probably the shower. Hopefully it's less than 9.2kW. The 30A breaker, or one of the red-dot fuses, may be the cooker - even if there's only an oven it's probably wired for a hob as well. The other two are presumably ring socket circuits. The white dot will certainly be the lights, and one of the blue will be the old immersion heater circuit - probably via the time clock on the right. The other blue could be anything, though probably a single appliance. It could feed a garage if there is one. The RCD arrangement is a bit odd. 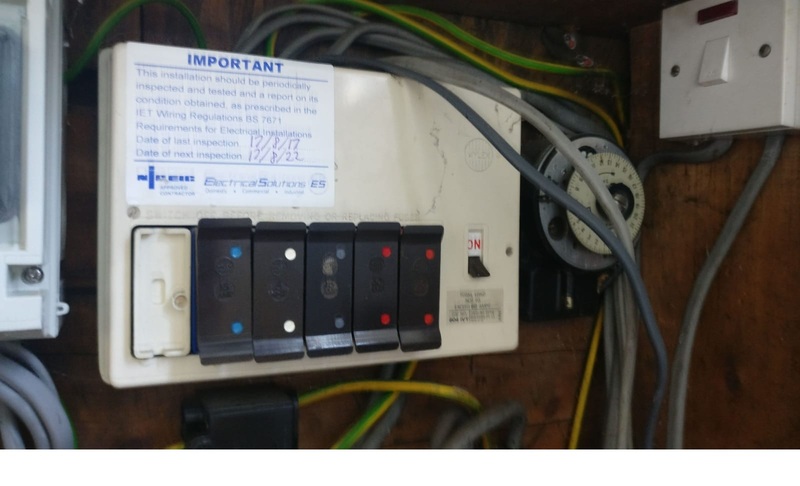 If the bottom RCD feeds both boards and is 30mA, then you've got no discrimination with the RCD in the top-left board - the bottom one is working as a whole-house RCD, which isn't to current standards as a trip will take out everything. 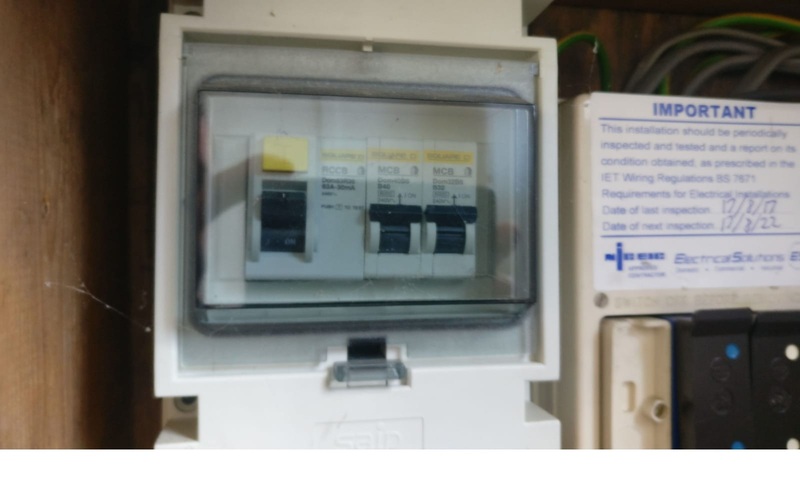 If the bottom RCD is 100mA time delayed, this is presumably a TT system with an earth rod, and there's effectively no RCD protection on the fuseboard. Alternatively the bottom RCD could just feed the old board, which isn't ideal as there isn't one switch to turn everything off. I've seen worse. One place with a whole collection of fusebox/CUs from the 1930s to present day. Why whoeevr fitted the modern one didn't include more ways & put the historic circuits into it I can't imagine. A dual pole fuse d 30A max fusebox with tool-lessly uncovered bare bits ain't ideal. Conundrum.... which opens first, a 13A plug fuse or a 32A MCB during a L-N short circuit? bulb blew and "wrecked" the fuse holders! Regs regarding CU fuse to MCB? Why didn't the fuse blow?